I was unsure what the quality of this machine would be, considering the low cost. However, the Family truly enjoyed playing a small version of Reno, without loosing a penny in the process. Also seconds as a back for loose change. Worth every penny I paid for the laughs! Bingo game prize and a gift! 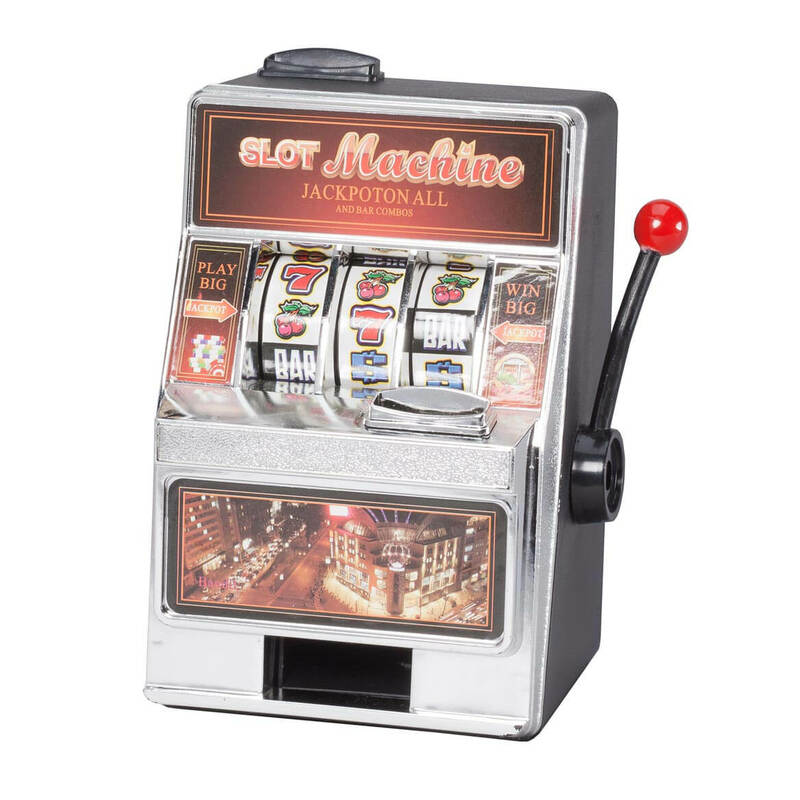 This is a very nice item but even the small slot machine is much larger than I expected. I would recommend it though. It is more suited for the older crowd, not for kids. It will be a Christmas present for my grandson who needs to save money. Also likes to gamble. Its different and think he will like it. Well I am 45 year old female who works all the time and these fun playing machines, will give me a chance to just that have fun at home and I get to save money. 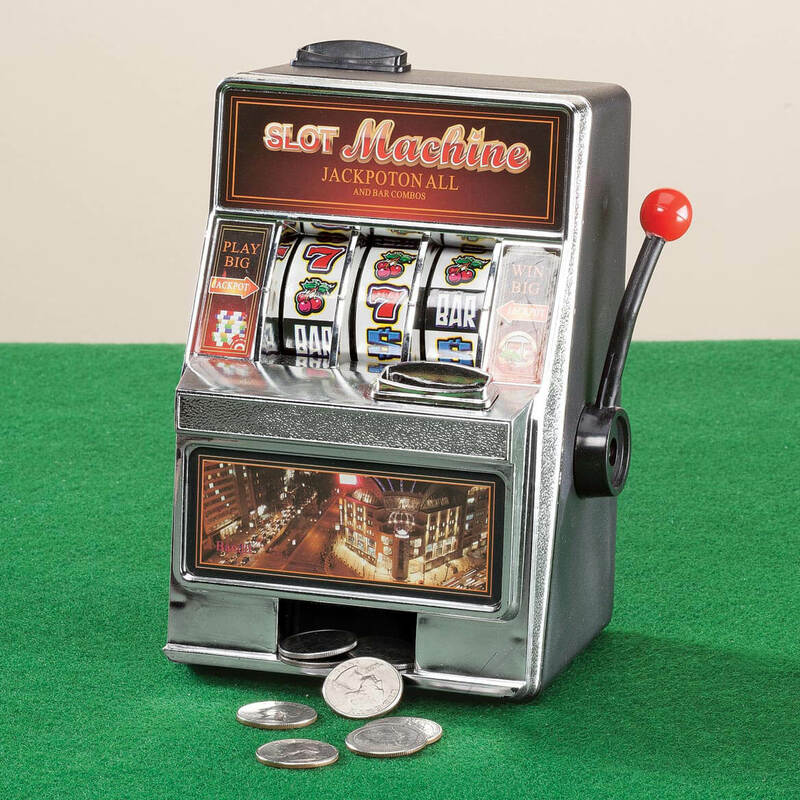 My mom's friend likes to have fun at the casino and so she thought that this miniature Slot Machine would be fun for her to have around her home. My two grandkids need something other than video games to keep them busy on rainy days at the lake. I ordered one for each of them, so no fighting about taking turns! I have a 40 yo "Learning Challenged" daughter that absolutely loves this game. We took her ( for her 25th Birthday) to the Casino in Delaware, once she "hit" and all the lights and bells went off then the money came flooding out, she was "Hooked" !!!! Needless to say life has changed and we don't go to the Casino, so, I hope she'll like this game. I would have liked the large one, but, I just couldn't find enough money. I'm sure she'll be happy. I shopped today for Bingo prizes for our Christmas party. This looks like a fun prize. I believe that our son-in-law who is a resident in a nursing home will not only enjoy this bank but have fun with it, too. I hope it lives up to my expectations. My mother is going to love this!! Cn you put paper money in the bank ? BEST ANSWER: I returned this item because it was much smaller than I had imagined. But from what I can remember, you can't put paper in the coin slot, but you can put them in the back tray where the coins are held in reserve. Thank you for your question. It takes coins only. We hope this information will be of help to you. How do you get the money out? BEST ANSWER: Thank you for your question. The door on the back of the machine looks like like a battery compartment, but it is the Savings Bank Door which you open to remove the money in the bank. We hope this information will be of help to you. Its on the back side there is as plate that comes off.